Prerequisites: Please be sure you meet the prerequisites before you purchase this product as it is non-refundable. Please take a moment to read through the entire process below before you "Add to Cart" and purchase. Thank you! Click above to add to cart after you have read through this entire page. Important: After you have successfully completed your payment, please log out and then log back in to your Access site account and complete steps 2, 3 and 4 below. You will find the links for steps 2, 3 and 4 on your Access account dashboard under My Account/Digital Downloads or in your shop order confirmation email. Be sure to check your junk/spam folder if you do not see the email in your inbox (or promotion tab for Gmail users). If you cannot locate the links on your dashboard or in your email, please email the Access Body Dazzle for assistance. Click on Add to Cart above and complete payment after you have read through the process below. Please complete all fields on the application. Please complete all requested fields in HelloSign and make sure to click the blue button when you are finished to submit your contract electronically. Please select the Data Protection Agreement in your preferred language and complete all requested fields in HelloSign. Also, please make sure to click the blue button when you are finished to submit the agreement electronically. This agreement specifies how you as a facilitator and sub-contractor must treat any data that you receive from us, for example via the web-site. For more information click here. 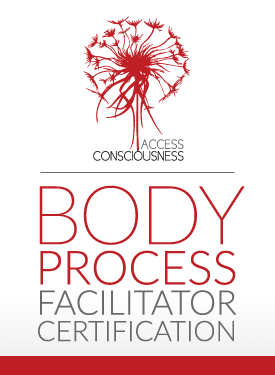 If you require any assistance please email bodies@accessconsciousness.com. Once you have completed the four steps above, a digital Access Body Process Facilitator (BPF) Welcome Packet will be emailed to you. *You will receive everything electronically (including your contract) so please double check that your email address is correct. Note: You are not authorized to begin Facilitating or scheduling Access Body Process classes until you receive your BPF Welcome Packet. Pay a non-refundable annual renewal fee - You will be sent an email when your renewal draws near and have the ability to make payment at that time. You can also pay your renewal fee within the month before it is due (as long as you have your qualifying renewal class) by going to your client dashboard and under Facilitator Tools, click on Certifications. You will be able to renew from there.